Fight and jump through this action adventure game. Is there a better alternative to Apple Avengers? Is Apple Avengers really the best app in Action category? Will Apple Avengers work good on macOS 10.13.4? Apple Avengers is an Action/Adventure/Platformer that puts you in the role of Fuji, a heroic apple who embarks on a quest through 5 bright and colorful worlds overrun by an army of worms. You will earn 7 different Powerups throughout the game allowing you to transform into one of the legendary Apple Avengers. Use their skills to fight, jump, fly and roll your way through 55 levels of platforming madness. Can you stop King Lumbricus and his army of Wild Wacky Worms? Come jump in and find out. With loads of content, "Apple Avengers" provides a gaming adventure you will surely never forget! Apple Avengers needs a review. Be the first to review this app and get the discussion started! Apple Avengers needs a rating. Be the first to rate this app and get the discussion started! 2 Game Modes - Story Mode and Apple Dash! 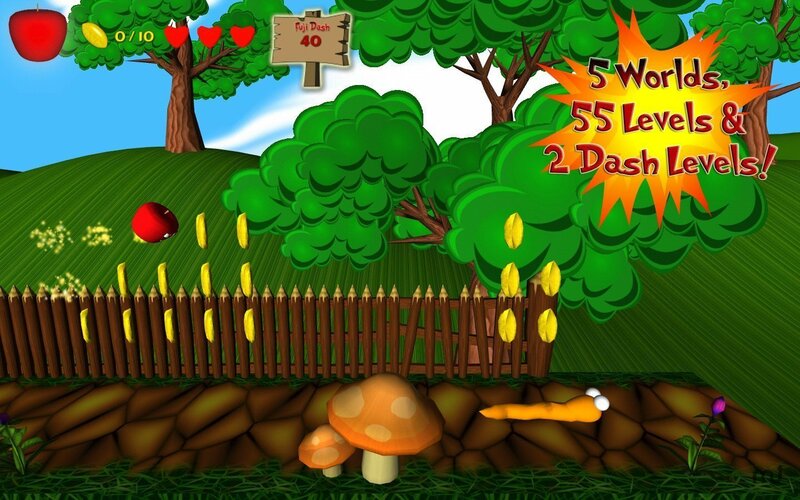 Complete a lengthy quest or engage in a unique automatic running game where you collect items and kill enemies to gain points while running for the highest score. Play with the keyboard or a Mac OSX compatible gamepad. The game comes pre-configured for the Logitech Gamepad F310 but works with any gamepad compatible with Mac OSX. The controls are fully customizable. Beautiful High Resolution graphics. The game has been revamped to support the Mac with gorgeous lighting effects, fog, terrain, high resolution textures, colorful scenery and additional special effects. 5 colorful and imaginative worlds, each with their own distinct theme, style and challenge. 8 playable characters and several unique abilities including Super Speed, Super Strength, Invincibility, Flight, Artillery, Slow Motion and more! More than 20 enemies and 5 epic boss fights. Each enemy has a different attack style so you better prepare for battle! 10 golden seeds are scattered throughout each level. Collect them all to unlock the bonus world upon completing the game for a true challenge! User friendly controls and easy learning curve.